Talitha and Octavia are forced to spend their summer vacation with their Grandmother Marey Lee Boyden, journeying into almost all over USA. Their Grandmother, known as Mare is unlike any other grand mother, one can think of. She drives a red car, has long painted nails and wears push-up bras. The teenaged girls aren't too thrilled to spend their summer with her. But Mare has a past, which she reveals to them while driving in her car. When her past is revealed, the girls slowly to come to learn about their grandmother. 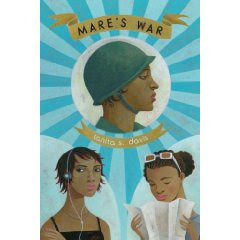 Mare had lied about her age to join the 6888th Africa American battalion of the Women's Army Corps during World War II. Mare was only 17, when she decided to join the army. She had an younger sister Josephine. When their Mama sent Josephine to Philadelphia, Marey Lee had no reason to stay and do menial work. She enlisted herself into the army to serve her country. Marey did not wish for a life like her Mama's, where one depended on a man for ones happiness and she also had no plans of getting into trouble having babies. Joining the army gave her purpose in life. She made lasting friendship with some other enlisted women. And she also travelled to war ridden places like England and Paris. Told in alternate chapters of Then and Now, Mare's character comes forth beautifully and her equations with her grand daughter's too slowly changes. At a first glance, this might appear to be light read but it isn't so. It speaks of a girl, who knew what she wanted of her life and how and she also knew that she had to come back for her little sister "Feens". Mare had all her priorities right and she set an example for Feens and also for Talitha and Octavia. The journey in itself is a reunion. The girls understand that at the end of it and are proud of their Mare! Those who want to read about WWII, relationships, responsibilities and familiy values will find it all here. It also deals with the discriminations coloured people faced even during the war. This book sounds so good. I almost bought this the other day, but put it back because I had so many other books picked out - now I could kick myself. This sounds interesting. Love the grandmother road trip aspect and the military one. Great review! This does sound like a good one, Gautami. It isn't often you come across a book about a women who enlisted in the war before she reached legal age. Thanks for the great review. I love the books you find! I would definitely read this. I actually want to be like the grandmother when I get old and grow old disgracefully. Though you can see how it starts light hearted and then becomes a heavier read. Ooh. This definately sounds like a book I would enjoy! Sounds really good! Something i must keep a look out for! Ooh...this one sounds really good. I'll get this up on War Through the Generations soon. We've linked to your review on the War blog. Thanks for participating. We hope you will participate in the Vietnam reading challenge for 2010.